As a kid, I loved to collect a huge pillowcase full of Halloween candy. The thought of getting another Snickers at the next home kept me moving from home to home until I was practically dragging my sack of candy along the ground. My favorites were eaten almost immediately. The rest were left to linger over a period of time until I ate even the candy that I didn’t really like. Because it was there, I guess, I fell to the temptation. 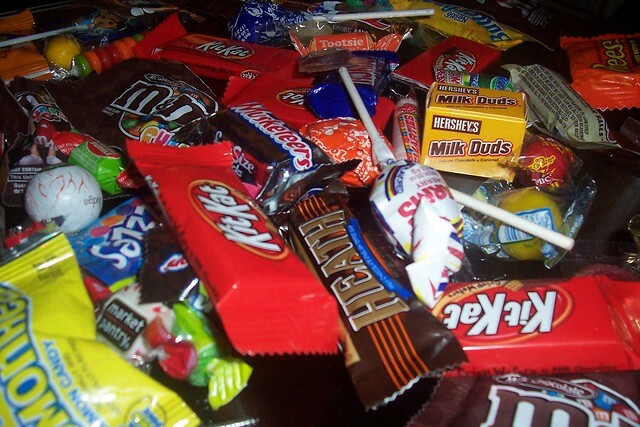 The average child brings home about 5000 calories of candy on Halloween night. It’s not a good way to start November; the opening salvo of a period well known for holiday weight gain. A child would have to walk for 44 hours to burn off all those calories. It isn’t just kids that are eating candy at Halloween. Nearly half of parents admit that they eat some of the candy that they bought to hand out to children. And almost all parents (90%) say that they have secretly eaten candy from their children’s Halloween haul. Although another study found that only 71% of parents were pilfering the candy, it is a significant number no matter how you look at it. Americans consumed 24.7 pounds of candy per capita in 2010. Halloween is responsible for nearly 25% of that consumption. Dentists have warned for years about the dangers of candy consumption for your smile. The constant consumption of sugar without proper brushing isn’t good oral hygiene. It promotes tooth decay. They are now putting their money where their mouth is. Operation Gratitude runs a Halloween candy buy back program that takes donated candy and sends it as part of care packages to American military troops overseas. In many areas, you can find a dentist who will buy your candy for $1 a pound and ship it to Operation Gratitude. Be mindful that some dentists have a limit on the amount of candy they will buy from each child as they don’t want someone backing up a dump truck full of candy. Or you can donate your candy directly to the cause. They will accept candy donations through the beginning of December. Operation Shoebox also accepts Halloween candy donations. Take it to work. There will always be some poor sap without kids who will scarf down the candy out of boredom. Just don’t put it on your desk, where you are likely to eat more of it then they do. Freeze it. It makes distributing it in moderation easier as you have to wait for it to thaw before consuming it. Throw it out. Just do it. Keep your favorites and toss the rest on November 2nd, when you are sick of the candy because it has already given you a tummy ache! The two most interesting suggestions that we discovered? One suggested to save the colorful candies to decorate your upcoming gingerbread house. The other suggested to throw the candy (as well as the pumpkin) on the compost pile.